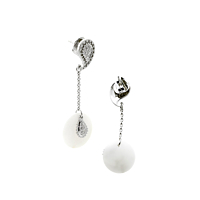 These incredible dangle earrings by Carrera y Carrera are a fresh and one-of-a-kind design from the Aqua collection. They feature stylized paisley motifs encrusted with round brilliant cut diamonds. While these earrings have a distinct modern appeal, the use of delicate white gold chains, diamond accents and recognizable motifs give them widespread appeal. Because these earrings are easy to pair with your favorite chain necklace, creating jewelry ensembles for any occasion will be almost effortless. The elegant length of these white gold earrings draws the eye to the neck, showcasing one of your most feminine features.